It’s been a few years since I was in Nashville. I think the last time was spring of 2003 and that was for Rites of Spring, Pearl Jam, and Buffet. A lot has changed since then and this time instead of a concert, I was on my way to a wedding. Unfortunately the wedding wasn’t in Nashville, it was in Toledo. With no interest in flying to Detroit, I decided the best way to get to northern Ohio was to drive and that mean I needed a good stopping point. Enter the city of Nashville. Knowing I would be stopping in my Nashville, I decided to call the only person I knew in the city, Shelley. Sorority sister to my sister Jennifer, I was almost positive that Shelley would be racked with work from her firm and unable to join me for dinner. Imagine my surprise when Shelley said dinner would be great. It was a win-win situation. I would have a companion for dinner and Jennifer would be jealous. Not knowing the Nashville’s dining landscape, I immediately started browsing through chowhound for suggestions. With some vague idea of what I was looking for, Shelley and I began batting around ideas. 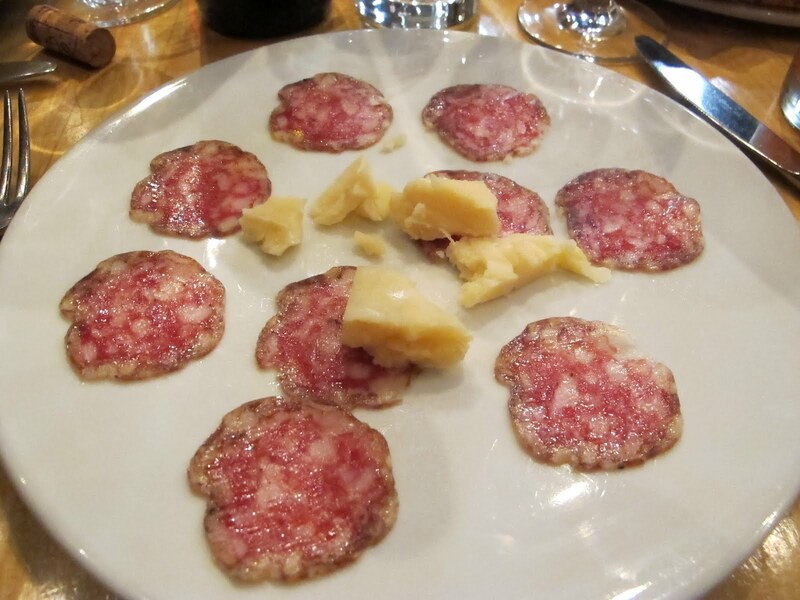 I was looking for something unique to Nashville preferably with some house charcuterie. Shelley suggested City House and I had heard good things from Chowhound. After finding a spot on the street, I was happy to walk into City House and see an open kitchen. Shelley and her friend Amy had beaten me there and had already started on a bottle of wine. Once I had a little drink of my own, I took the time to look over the menu. I was immediately torn over an appetizer. Stuck between house cured salami and house cured lonza, I eventually settled on the House Cured Salami with WisAntigo cheese. Described as a Venetian Style salami with flavors like nutmeg, garlic, clove, and cayenne, I was curious how this salami would actually taste. 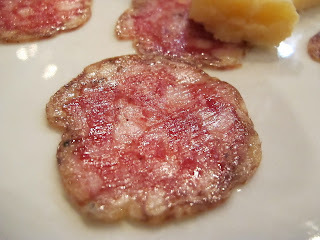 Each slice was heavy on the clove and ginger but a nice salami regardless. 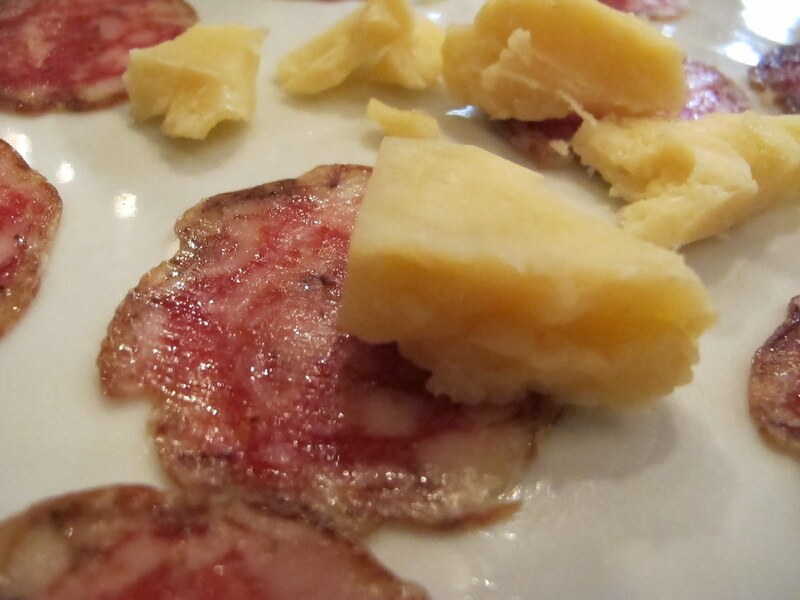 The oddly carved chunks of WisAntigo cheese were a nice companion although I found the two were best taken separately otherwise all I could taste was the cheese. 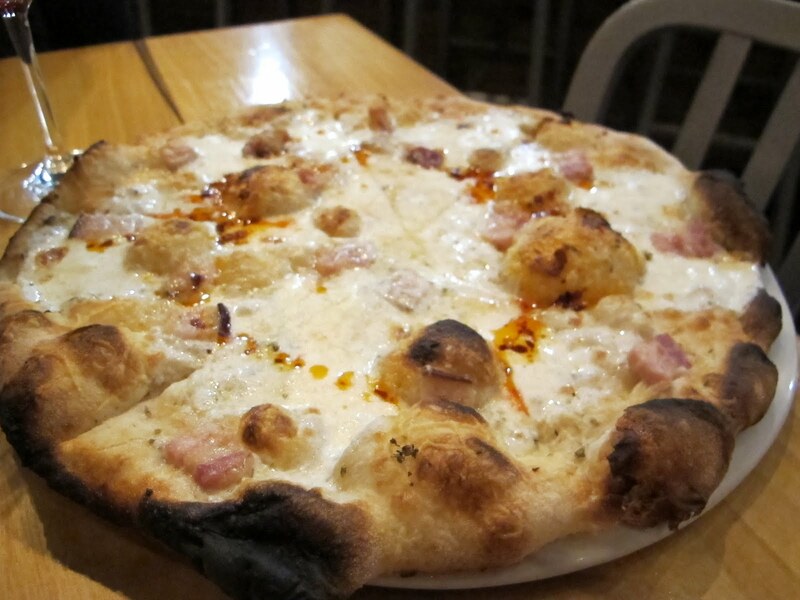 Hoping that Shelley and Amy would help me, I decided I had to try one of the pizzas, particularly the House Made Belly Ham, Mozzarella, Grana Padano, Oregano, and Chilies pizza. Seeing the blisters from the heat, I was already a fan of the crust on the pizza. 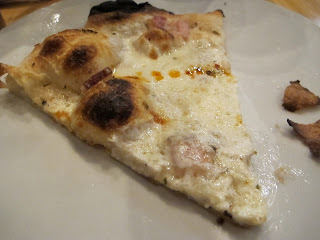 With a spicy chili oil and a relatively subtle cheese this wasn’t a half bad pizza. Unfortunately, the bacon was all but missing from this pie. Sure there were a few pieces but they were lost in the combination of cheese and chilies. I suppose it was an absentminded coincidence, but I finished the house made trio with the House Made Sausage with Onion Agrodolce and horseradish. 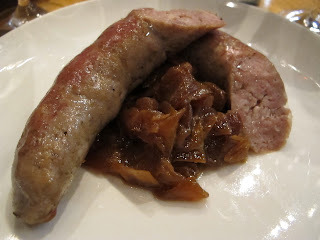 The sausage was plainly the best of the house made trio. Juicy and peppery, it seemed like more than the advertized eight ounces. As for the onion agrodolce, I loved the condensed flavors, but it was served stone cold. I asked the waiter if that was intentional and he in turn asked the kitchen. He said room temperature was to be expected but these onions had a chill to them. 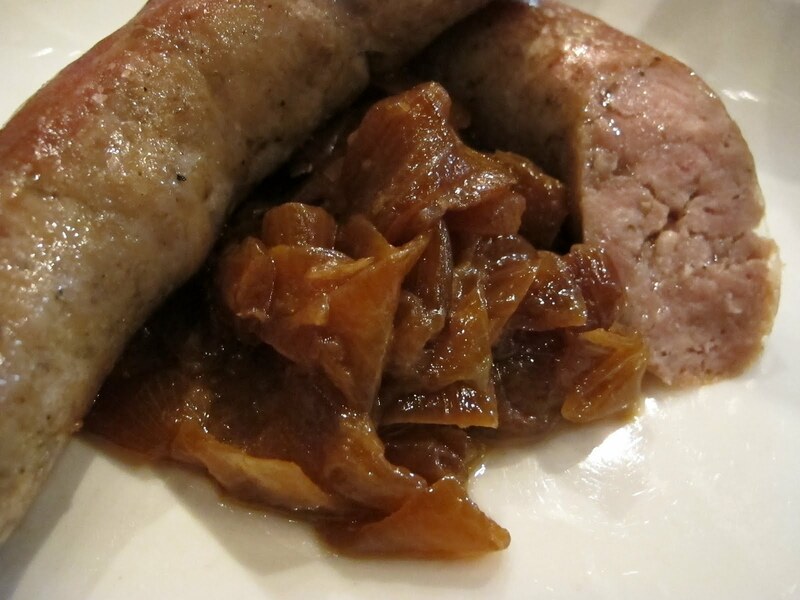 Even with cold onions, when combined with the sausage, it was a worthwhile entrée. 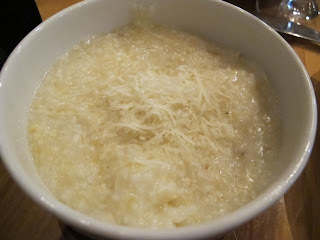 Having heard great things about the sides, I decided that the grits would work very well with the sausage and onions. Creamy, cheesy but distinctly reminiscent of Quaker Oats instant grits, needless to say, I left these grits to their own devices. At that point, I thought we had ordered plenty, but when Shelley and Amy suggested dessert, I was a pushover. Looking through the dessert menu, I was immediately drawn to the dessert cocktails section. I normally stay away from noxiously sweet drinks, but the I.M.T.R. made with Jack Daniel’s Cream and Root Beer sounded too interesting to pass up. Named after our waiter’s pet rabbit, the I.M.T.R. (International Monster Truck Rally) was definitely creamy, but overly orange. I had a hard time accepting that orange peel dominated that much, but it did and the whole drink tasted like an Orange White Russian. 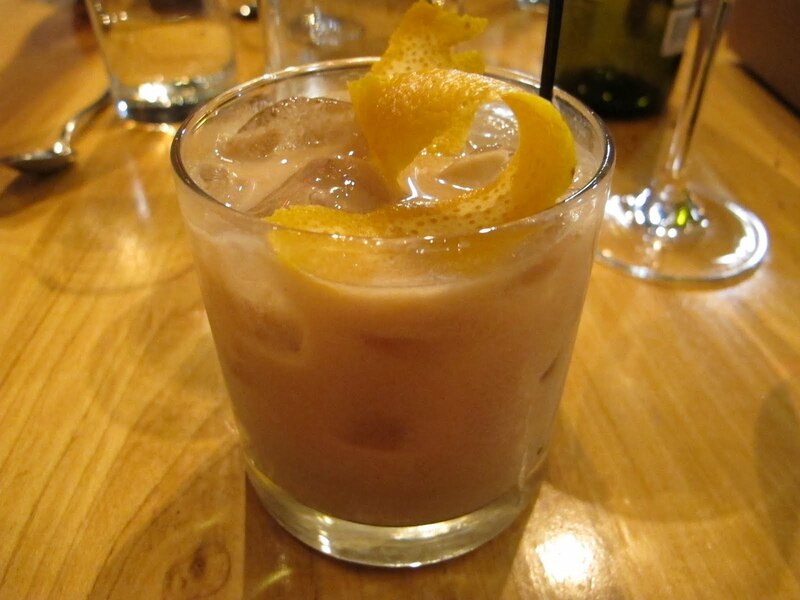 Actually make that an Orange White Russian made with skim milk. As long as I had crossed the line into dessert territory with that cocktail, I figured I should dive in head first. 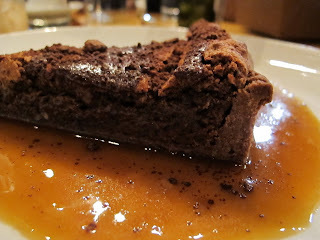 For me that mean seeing just how good the Chocolate, Pecan + Poppy Torta with Chocolate Ganache and Coffee Syrup was. With everyone sharing desserts, we quickly agreed this was a lot like a flourless Chocolate cake. Actually I thought it was undercooked but delicious nevertheless. 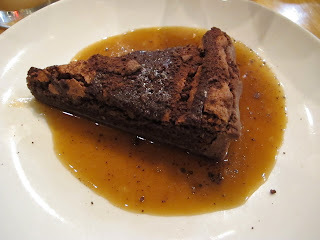 Granted it’s hard to go wrong chocolate ganache and coffee syrup. I might have to chalk up some points for the amicable company, but I really enjoyed City House. Yes there were a few setbacks like the missing bacon on the pizza, the cold onion agrodolce, the watery cocktail, but the good far outweighed the bad. In the end, City House was a fine way to reintroduce myself to the city of Nashville.